The brick paver project started in 1998 and continues today as a vital fundraiser for Rockwood 2000. Rockwood's Memory Lane is on display at Homecoming Park. 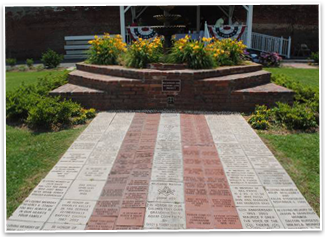 Currently we have more than 500 brick pavers recognizing individuals, civic groups, military personnel, pets, community leaders, companies, and various achievements. Some of the bricks show a sense of humor, such as “married 50 years and they said it would not last.” Three different brick paver sizes are available, 4 X 8, 8 X 8 and 12 X 12. Special emblems or monogram information may be added for an additional charge. On Memorial Day, 2011, about 60 new brick pavers, mainly for military personnel, were dedicated in a special ceremony. Rockwood 2000 believes that this is a part of our history and hope that we are leaving something for future generations to enjoy.